Virtual Desktop Infrastructure (VDI) solutions are becoming common place in the organizations around the world. The original thought behind most VDI solutions was to reduce costs and management associated with traditional PC�s. However, most VDI solutions end up being far more expensive and complex then originally expected for a number of reasons, including physical infrastructure costs, integration of multiple products and necessary implementation and support skills. SunFlower Virtual Desktop Administrator addresses a number of these issues, by keeping a more simplistic approach to VDI. 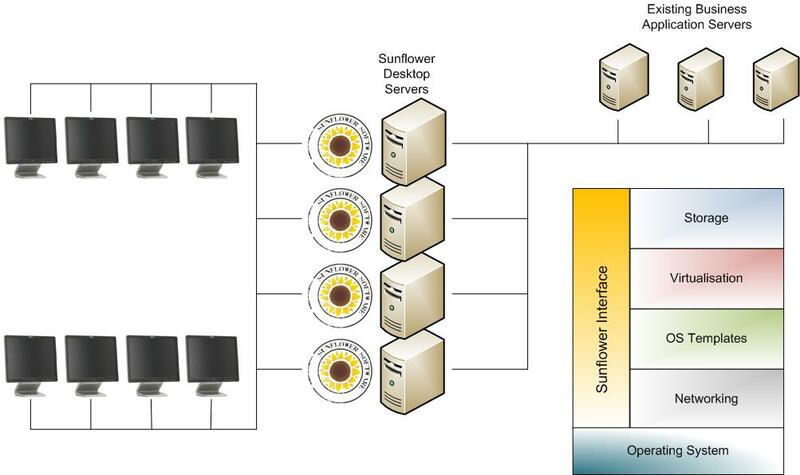 The architecture of SunFlower is highly configurable and can be adjusted according to budget and system requirements. It is possible to start on a single server and scale up and out to multiple servers as the requirement for more users is needed. This allows for a low risk, and low cost entry point into the world of VDI. It allows for minimal investment, both financially and in time, to allow our customers to gain confidence with VDI solutions in general and to see the benefits it can offer. A SunFlower based solutions is comparable in price to that of PC's, but provides much more flexibility and features, giving you more value in the long run. The user interfaces are intuitive and non-technical which means that any skill level of administrator can look after the system. SunFlower creates a robust, reliable integration layer between the individual components that are required for a VDI solution, namely Virtualisation, Storage, Terminals and User Operating Systems and Applications. It creates simple user interface that can be used to manage all aspects of the deployment using simple terms to describe the environment in the context of the users that are using it. For example, using the terms Classroom or Call Center instead of Virtualised Dynamic Desktop Pool. SunFlower shows our customers immediate benefits with its ease of deployment without having to invest huge amounts in infrastructure, training and skills transfer. The architecture of SunFlower is very simple and very flexible. It can run on a single server or scale up to multiple servers depending on the requirements. Centralised storage is not a requirement, but it can be used if required. Each SunFlower server is a self contained node that can function together or independently of other nodes that have been configured. It provides redundancy and load balancing by utilizing existing capabilities in the underlying products together with synchronizing components built into the SunFlower software. SunFlower is a Desktop Virtualisation Tool that allows a low risk, low cost entry into the world of Virtual Desktop Infrastructure (VDI) solutions. SunFlower is ideal for Virtual Desktops in Call Centers, Virtual Desktops in Education and Educational Institutes, both in traditional schools, universities and colleges as well as corporate training environments.